Well, the short answer is that, no, I don’t have anything to say about the change of venue. Simply put, in light of today’s current events, where the fabric of our society is being rent asunder for political advantage, the act of moving a mere baseball stadium 12 miles seems remarkably trivial. Of course, the long answer is that is what this blog item is about. The real fact of the matter is that while I once cared about major league baseball, I do not do so today. The break occurred during the 1994/1995 Strike. It was at that point that I realized that neither the players, nor the owners, cared the least whit about those whose paid admissions helped make all of their game possible. Baseball, always a matter of numbers, had thrown a key constituency over the side. And I was part of it. Simply, baseball would never be the same for me after that moment. Prior to that, baseball had been an interesting pastime for me. I saw my first professional baseball game at the age of seven, in Brownsville, Texas between two farm teams. Baseball is unique unto itself; just ask George Carlin. His monologue on baseball really nails it. Baseball is ethereal, quirky, odd. Which, of course, makes it remarkably appealing. Consider that the late Bart Giamatti gave up being President of Yale University to become the seventh Commissioner of Major League Baseball. Given the choice, who wouldn’t? “Let’s see here; attend yet another boring faculty meeting where all the faculty think that they can do my job better than I can.” Or…. “I get to be the head kid at the ball park, sitting there eating hot dogs and looking grand.” Smart choice. Baseball had ingrained itself into our society. On Saturday afternoons, it was the TV, Dad, me, Dizzy Dean and Peewee Reese. And Falstaff Beer. It was rightly called the national pastime. Either you liked baseball or you didn’t. What was boring to some was “languid”, “deliberate” or “nuanced”. But whatever else it was, baseball was always there for me. And I count on a large number of colorful stories about baseball, which we will save for another day. No, after the 1994 Strike, things were not the same for me. The fact that the Braves then won the World Series after everybody went back to work was a small consolation for the loss of something wonderful. The loss of the warm fuzzies of being at the ball yard and feeling that your presence actually mattered. What is truly remarkable about the move to a new stadium in Cobb County is that fact that it was a very well kept secret. Literally nobody knew except for a few select participants. Of course, the impact of the announcement was well tempered by the fact that a lot of people are worried sick about their health insurance. It was a perfect time to announce something controversial. Nobody paid attention. But there also is the sense that more than a few people had their suspicions since there had been extended discussions in the months prior. And not that there hadn’t been a few hints. When it was time to build a new stadium, it was built even further from the E/W MARTA line. For quite a while, if you wanted to take public transit to the stadium, the powers that be made patrons walk through Underground from Five Points Station to the buses to the stadium. And again on the return trip. For a period of time MARTA dropped all service to stadium. Last summer, during the negotiations with the Braves organization, the City of Atlanta came up with a high-pie-in-the-sky scheme to build a Mag-Lev train from Georgia State Station to the MIDDLE of the parking lot; not from Georgia State to the stadium, but to the parking lot. If the Mag-Lev scheme sounds familiar, consider that the MARTA “Civic Center” station is three blocks from the actual Civic Center, which I blogged about earlier. When confronted with the unpleasant reality of no-transit connection for a facility, the City always seems to come up with something unrealistic. This time it was a very expensive solution, at a time when two cheaper people movers are already operating in the City. And, this expensive solution did not offer a fully complete connection between MARTA and Turner Field. Yeah, that’ll really encourage public transit ridership. No, there has always been an orientation toward automobile access over public transit in Atlanta, and not just to the baseball stadium. At least the Falcons got it right, but I’m sure that was by accident. Regardless, Atlanta’s understanding about public transit still needs training wheels. We’re just not accustomed to being a big city with big regional transit needs. The recent TSPLOST vote results are proof of that. We’ve got a long way to go in this department. While we may not understand public transit, we certainly do understand traffic. As said before, whoever benefited from the parking concession revenues also had a powerful reason to stifle any rapid transit activity to Turner Field. And, in a related story, WXIA’s Doug Richards has started looking into the neighborhood’s use of allocated funds raised by the parking concession at Turner Field. There’s the fact that the Braves are leaving a ballpark served by mass transit for one that would be located at one of the most traffic-congested intersections (I-75 and I-285) in America, pumping tons of unnecessary carbon pollution into the air. It seems that Mr. Bunch has not noticed the fact that traffic is equally backed up at the nearby junction of I-75 / I-85 and I-20; my carbon load is just as big as yours. Likewise, Mr. Bunch’s belief that Turner Field is “served by mass transit” misses the mark by almost a mile. Perhaps he considers that limousine that picked him up at the hotel and rendered him to Turner Field is “mass transit”. Regardless of the heated prose, I don’t believe that we’re in the position to declare the Cobb County site as being a new source of unnecessary carbon pollution. And, given the three year time-frame before the move, it is always possible that infrastructure improvements will be made to the area, although it already has a nice street structure that helps alleviate traffic jams. Of course, there will probably not be rail-transit in the area in my lifetime, but I’m over being sore about it. You can’t change some people’s minds, so I’m willing to wait until an attractive and popular solution becomes available. You can’t change the course of 60 years worth of transit destruction. Things will be rebuilt in their own time. (As an aside, Cobb County did earlier consider rail transit, but rejected it. The proposed line would have run on an East / West route, with a track gauge that was different from MARTA’s standard gauge rails, making it impossible to connect to the “regional” MARTA system. Talk about being stubborn). 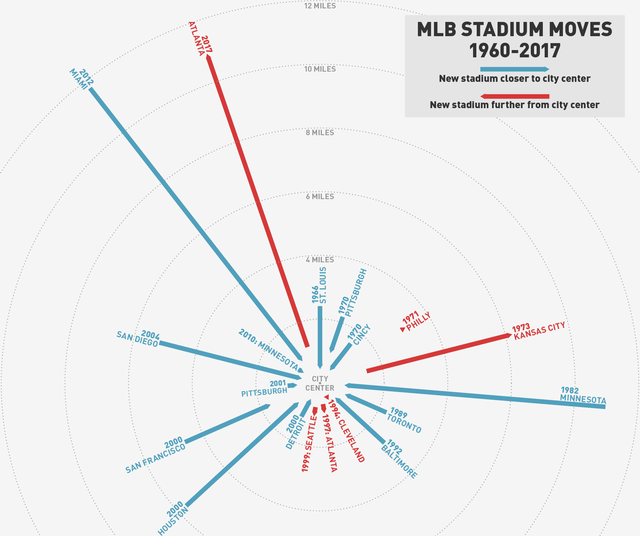 An interesting blog item points out that most other baseball teams are moving closer to their city centers. We can only speculate as to why this is happening in Atlanta. I’ll take a guess. Certainly part of the motivation for the move is due to the condition of the neighborhood surrounding Turner Field. It’s not pretty, literally. Across the street from the stadium, along the right outfield side, is a boarded up apartment house. Down the street is a liquor store with bars on the windows. Further east on Georgia Avenue are more boarded-up buildings. Across Hank Aaron Drive are the remnants of another misguided project, Fanplex, a $3 million waste of taxpayer money. There are three “economy” hotels for the convenience of Turner Field visitors, along with a barbecue restaurant along the third-base line side of the park. In short, this is what visitors to Atlanta see when they go to a ball game. It’s sad, in a Detroit-kind of way. And you have to wonder if this is the best that Atlanta can do. If I were an executive of a business that had a multimillion dollar payroll operating in a multimillion dollar facility and I looked out of my office window and saw the neighborhood, I’d start thinking about moving, too. And, there’s the haunting fact that Atlanta has had almost fifty years to address this problem. One of the interesting facts about the Braves’ move is that, concurrently, there was a public policy issue discussion about taxpayer support of the new Falcons stadium. Inevitably, these discussions seem to gravitate toward the cost / benefit analysis of a massive expenditure by government. Preposterous dollar amounts are bandied about concerning the economic effects of having people coming to sporting events. It’s along the lines of “3.4 people come to Atlanta from outside of town, spending $2,756.43 each per day on lodging, food, drink and tchotchkes“; all for the greater economic benefit of the City. The whole thing is very nebulous, very much in the manner of Viet Nam body counts. I’m sure that those who draw up these numbers will snort and harrumph, but, let’s face it, it is all just an educated guess. So, in that vein, let’s compare Braves to Falcons. 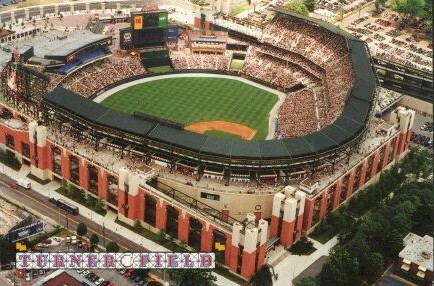 Just ballparking here, but the Braves had 81 home games in 2012, with a grand attendance of 2,420,171. You can look it up. In contrast, the Falcons had 8 home games, with an attendance of 560,773. Assuming that baseball fans and football fans typically spend the same amount of money, baseball would seem to be a better generator of cash for the local economy. And, of course, the teams’ performance will affect those numbers, too. Makes you wonder how Chicago does it with the Cubs. But, then again, they need two teams just to keep things going. I would be remiss if I didn’t comment on the fact that sport teams are remarkably willing to get someone else to pay for their business expenses, all in the interest in helping the local economy. There, I’ve said it. Given the apparent disparity between attendance figures, and the related economic effects upon the local economy, it would seem that keeping the Braves was a better deal than keeping the Falcons. But, there’s another deciding factor. Arthur Blank, lead owner of the Atlanta Falcons is local-boy-done-good. He’s all ours. The Braves are owned by Liberty Media, a cable company operating out of Denver. It’s hard to get attached to them. When the news of the Braves’ departure hit the media, the Mayor’s office was quick to gloss things over. “Atlanta Mayor Kasim Reed promises enormous middle-class development at Turner Field“. Note that this new development will be “enormous“. Also, note that when there’s nobody else left to help, the middle-class is always there to fill in. The focus groups tell you so. And, not everybody in government attended the meeting for the new middle-class development. I have a number of business relationships in Milwaukee, Wisconsin. I love the town and the Brewers play decent ball. I also had a business relationship with the late Dorothy Daugherty, who worked for one of my vendors. I liked Dorothy greatly, and she helped me with my business career on several occasions. Whenever I was in Milwaukee, I always made a point of taking her out to lunch. I always bought and we would always talk about what was happening in our industry and about the people that were a fascinating part of the business. Which tells you just how far baseball has come in the intervening 50 years. 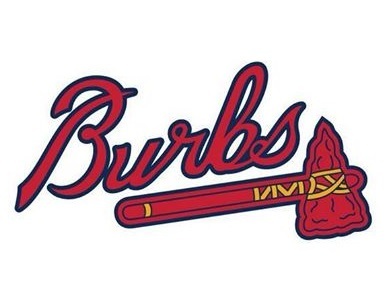 To be sure, there are those who are upset about the Braves leaving downtown Atlanta, but I’m not one of them. It’s just a business decision made by a corporation in response to a political problem that was solved by another political group. There’s no heart or soul involved. And, by the way, the Macy’s holiday tree this year will be a fake one standing in the parking lot of Lenox Square.